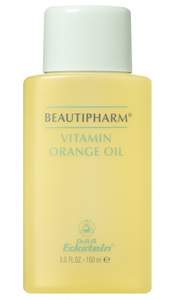 Vitamin Orange Oil is a stimulating and enlivening massage or body oil. It is light and easily absorbs into the skin without leaving a sticky residue. Vitamins A and E, in conjunction with essential fatty acid glycerides, protect against a loss of tone in the skin and connective tissue. In addition, Vitamin E influences the circulation of the peripheral skin layers. It hydrates and restores the skin, making it soft and smooth. The natural aromatic orange oils stimulate and refresh the skin and body. It is especially beneficial during the vitamin poor months of the year where the skin can appear faded or pale. Use starting in late autumn as a preventative skin care treatment and continue through the winter. Highly recommended at a treatment for sunburn and after sun/tanning treatments.